Waitrose watercress is nourished by clear spring water in shallow, gravelly beds. It’s these perfect conditions that give our watercress its fantastic flavour. 1. Cook the Jersey Royals in a pan of boiling water for 8-10 minutes until tender. Drain and toss with the butter and dill. 2. Meanwhile, season the salmon fillets with black pepper and cook under a medium, preheated grill for 3-4 minutes on each side until cooked through. 3. Place half the bag of watercress in a food processor and whizz until very finely chopped. Add the crème fraiche and 2 tbsp of the honey and mustard dressing and pulse until well blended. 4. 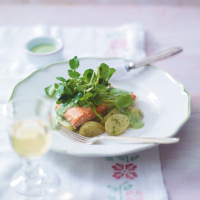 Pile the potatoes onto 4 plates, sit a salmon fillet on top of each serving, then spoon over the watercress dressing. Lightly toss the rest of the watercress with the remaining honey and mustard dressing and place on top of the salmon. Serve swiftly.